In The Room featuring Reuben Barsky, Susan Neuffer, Suzy Jane Hunt, Jacob Perkins, Rob Robinson, Chelsea Melone, and Matt Harrington. Photo credit Jeremy Daniel Photography. The “play within the play” has been a useful dramatic trope at least since Shakespeare’s Hamlet, in which the actions in the traveling players’ “The Murder of Gonzago” help young Hamlet attempt to “catch the conscience of the king.” Lawrence Dial now adds to that tradition with the appealing In the Room, directed by Adam Knight and presented at the Alchemical Theatre Laboratory by the Slant Theatre Project and Kelli Giddish, in association with the Wheelhouse Theater Company. There are actually multiple plays within In the Room—or, more accurately, there are fragments of drafts of multiple plays. The setting is a New York City theater facility where an established (but currently unproductive) playwright, Seymour (Matt Harrington), has begun teaching script writing to a cluster of aspiring dramatists, of various skill and experience levels. The classroom eventually becomes a troubled carnival funhouse of sorts. With everyone holding mirrors up to nature, glaring misunderstandings occur about what is real life and what is imagined. Anyone who has participated in a creative writing course will appreciate Dial’s skill at capturing the evolution of the classroom dynamic. The play begins in the midst of what is presumably the course’s first session. Students warily size up Seymour and one another. Seymour, meanwhile, attempts to gain their trust. Complications ensue when a student named Rainer (Suzy Jane Hunt) arrives. She and Seymour share a long and checkered history, something the other students will eventually come to glimpse. In a series of cinema-like vignettes, the rest of the course unfolds. During early class sessions, Seymour guides the students through simple exercises to spark their imaginations. Gradually he assists each of them in finding the buds of a story that might blossom into something stage-worthy. Along the way the students strike alliances. They come to harbor jealousies and resentments. They experience breakthroughs and setbacks from week to week. (The actors are aided in depicting these developments by the excellent work of costume designer Kristina Makowski, whose garments subtly reflect the progress of the characters through the course.) The students come to know one another, largely through the pages of scripts they share with one another. Their intimacies are intense, but also unstable: founded on perceptions that are, literally, shaped by fiction. The production’s very capable cast members meet the challenge of acting in a naturalistic manner while also honoring the more expressionistic elements of Knight’s direction (notably, the slamming of chairs and tables in staccato unison during scene transitions). Reuben Barsky and Chelsea Melone are especially good as Herman and Lydia, students who consider themselves underappreciated pros. Susan Neuffer has some effective moments as Clementine, an older student who forges an unexpected friendship with Jessie (Robert Karma Robinson), the son of a playwright of some renown. Jacob Perkins is both affecting and very funny as timid musical-theater nerd Scott, who eventually emerges from his shell. One of the production’s most memorable scenes shows Scott experiencing a sudden, delighted “aha” moment while writing. Harrington and Hunt are both fine in their roles, and I understand why Dial foregrounds the relationship of their characters: the relatively sophisticated Seymour and Rainer. But perhaps their story dominates the action a little too heavily toward the end. 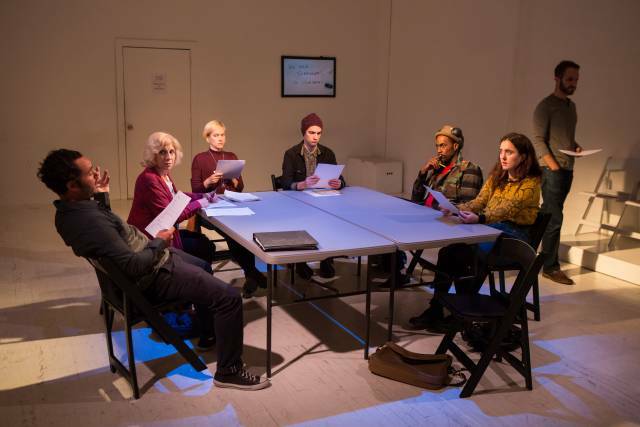 In the Room, at heart, calls out to be an ensemble show, focused on the fragility and resilience of this band of untried playwrights, trying the best they can to make art.